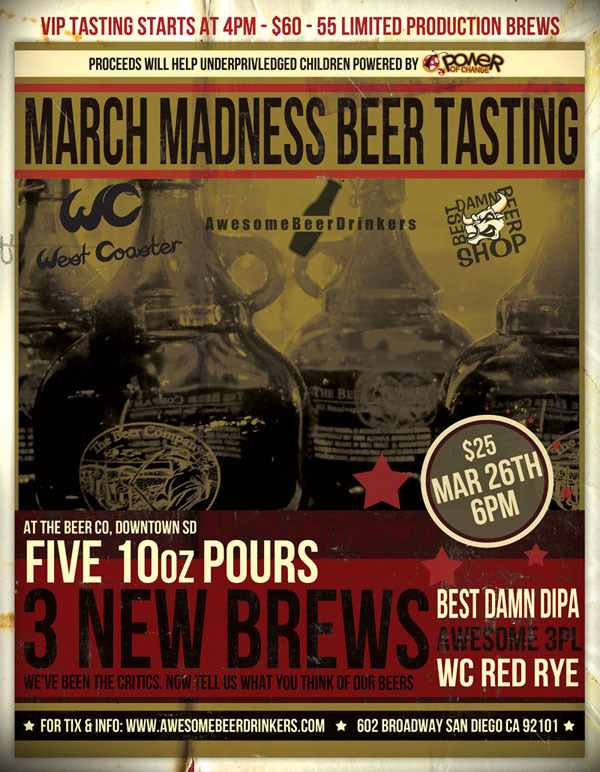 Posted by Jeff Hammett in beer reviews, breweries, green flash brewing co., pizza port carlsbad, stone brewing co. The Stone Brewing Co./Green Flash/Pizza Port Highway 78 Scotch Ale collaboration might have been the collaboration beer I was looking forward to the least out of all the Stone collaborations released to date. My experiences with Scotch ales is limited because I just haven’t liked the majority of Scotch ales I’ve had. Thankfully Highway 78 Scotch Ale exceeded my expectations. Highway 78 Scotch Ale is named after Highway 78 which more or less runs from Stone Brewing Co. in Escondido past Green Flash in Vista and ends near Pizza Port in Carlsbad. This 8.8% ABV beer is stronger than many of the Scotch ales I’ve had in the past which I think helped balance it out. It pours a very dark red with almost no head (with a careful, but not too slow of a pour). The smell seems a bit muted, I don’t get much out of it, although it is a bit sweet, think toffee or caramel. The taste is sweet and smoky, a bit of toffee and breadiness with quite a bit of smoke. The high alcohol is also apparent, but helps balance out the sweetness. 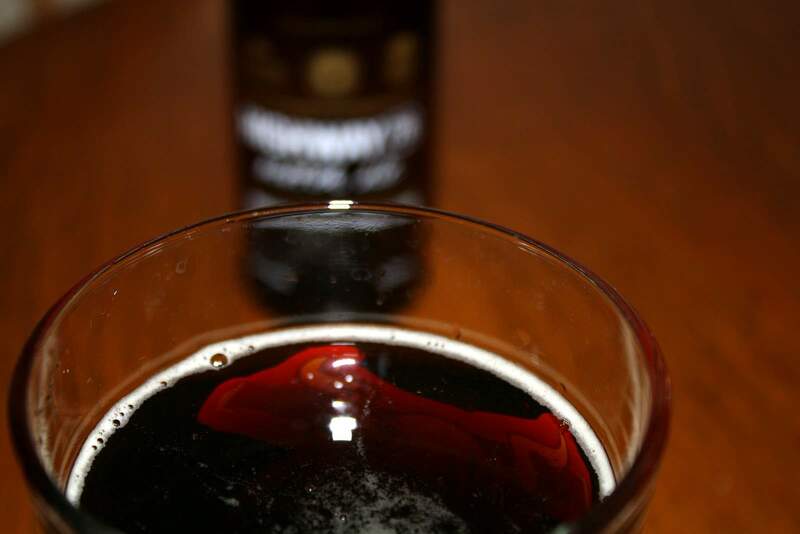 One of the things I often don’t like about Scotch Ales is the cloying sweetness that can often make them hard to drink. This isn’t the case with Highway 78. Unlike most beers Stone puts out, hop bitterness is almost nonexistent. They used East Kent Goldings and Target hops, which they say “provide a very modest backbone of peppery hops”. There was a very slight bitterness to the finish, but nothing about this beer would I describe as hoppy in the least. 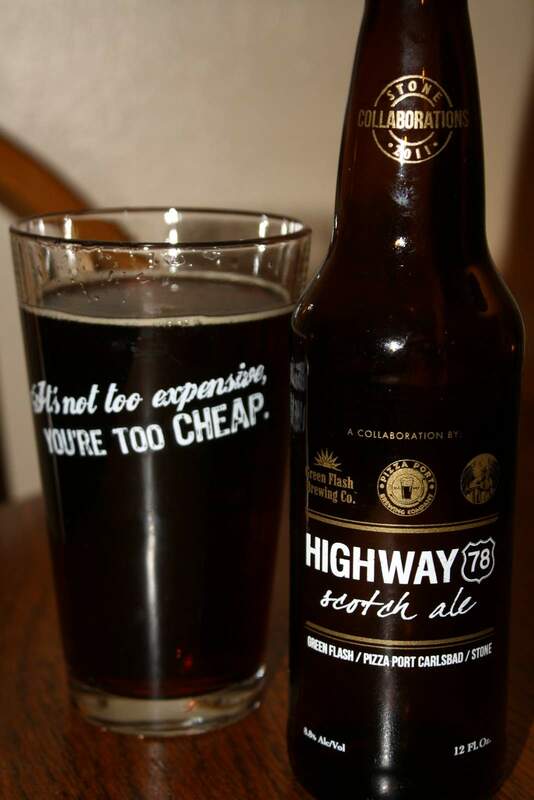 Highway 78 Scotch Ale was released February 14th, 2011 and should be available in most market’s Stone is in. Here in San Diego it’s on the shelves at most better bottle shops and on draft at some bars and restaurants. I picked up this 12oz bottle for $2.99 at Palm Springs Liquor in La Mesa. Stone collaborations tend to be available for a while at many liquor stores, this is certainly a beer I’ll drink again. I’ll also be on the lookout for more higher ABV Scotch ales to try. Jolly Pumpkin has quickly become one of my favorite breweries. All the beers I’ve had from them (which is only a handful, but they’re that good) are funky and tart, but not overwhelmingly so, and still possessing plenty of other characteristics. 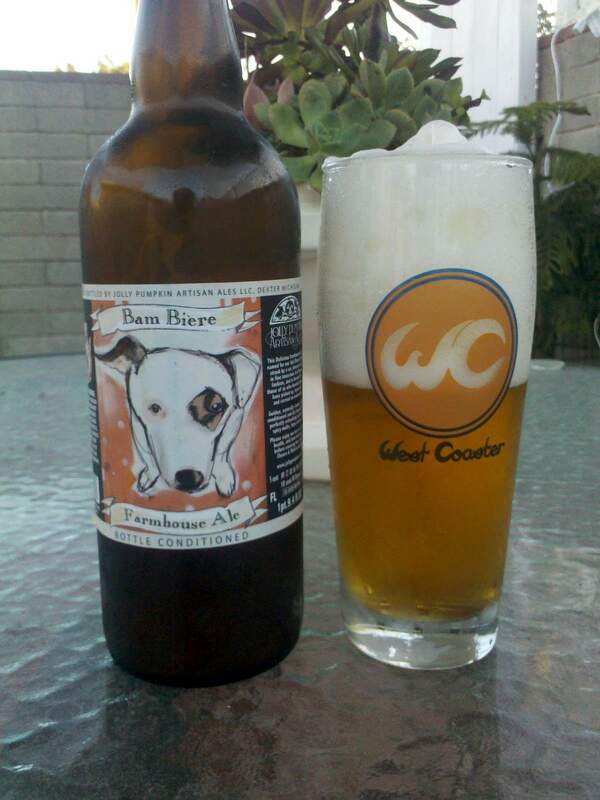 This was actually my first time having Bam Bière, one of the many farmhouse ales they brew. 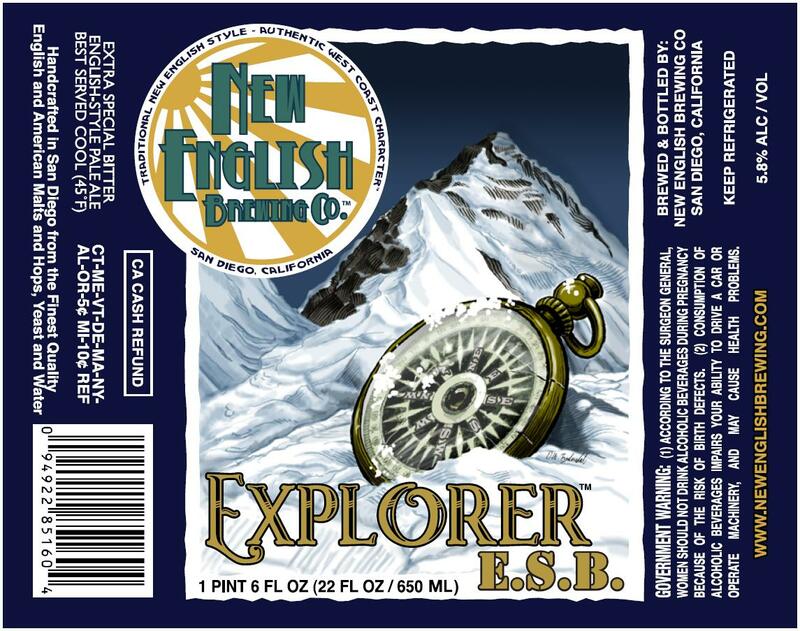 This 4.5% ABV beer is light and refreshing but still has plenty of character. I drank it on a cool evening a few days ago, and while I greatly enjoyed it, I think it would be much better on a warm summer day. I purchased this 750ml bottle for $13.99 at Texas Liquor in Carlsbad, I realized later that I had over payed for it by about $4, I’ve seen it at other liquor stores for $10 since. There was no date code on the bottle but it had a sticker that said “Batch 470”. I wasn’t able to find any sort of list online that matched batches with brew or bottle dates but a bit of searching leads me to believe this is could close to a year old. If so it’s certainly held up well, but I would like to try it from a known fresh bottle sometime. The bottle foamed up quit a bit when I opened it, but I wouldn’t call it a gusher. The foam reached just past the top of the bottle but didn’t spill. I started carefully pouring it into the glass but there was no hope, it ended up more than half foam. I spent about 10 minutes letting the foam settle and pouring more until I got what you see in the picture. The foam was a fine silky white and the beer itself was a hazy light gold color. The smell was tart and reminiscent of green apples, Granny Smith apples to be exact. There was a little bit of breadiness in the aroma, but it was mostly tart apple. The taste was much the same. The first sip was almost overpowering with it’s tart green apple flavor. After my taste buds adjusted it got better, the apple flavor seemed to fade (or I just got used to it) and it was more of the regular sour/tart flavor you might expect. There was a lot of citrus, maybe lemon peel, and more bread flavors as well. It felt a bit thin, but not enough to detract from the beer. The thinness might help make it more refreshing when it’s warm out. Bam Bière was far more sour and tart than most other Saison/farmhouse ales, but that is to be expected with Jolly Pumpkin. 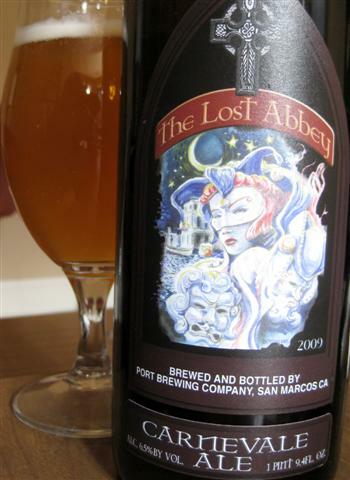 There weren’t many spices or spicy yeast characteristics that many other farmhouse ales have. This could be due to the (potential) age of the bottle. It’s a solid beer, good with age on it, but I do plan to make a point of trying it again when I know it is fresh. 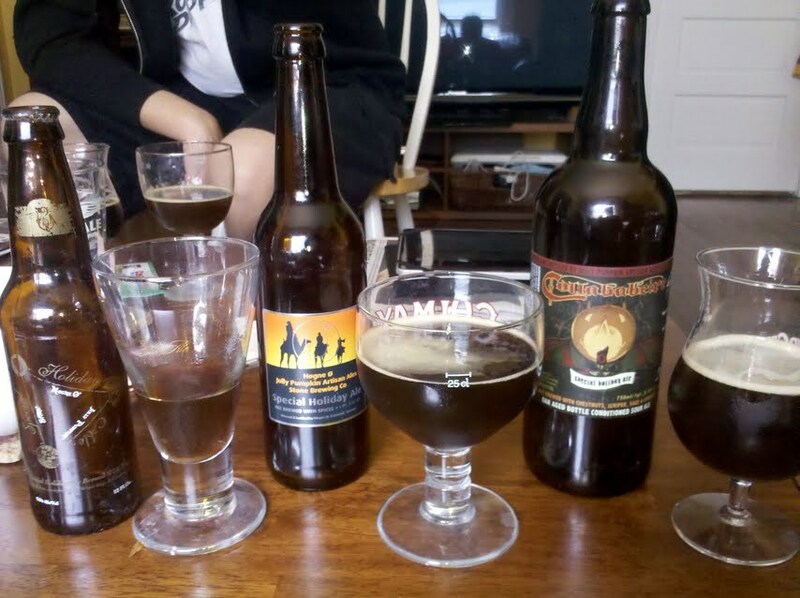 This past weekend a few friends (on Twitter: @RedTheTrucker, @thepegisin and @deniserat) invited me over to taste some beers. Big thanks to them, they provided all the beer, I owe them big time, and were great company to spend an afternoon drinking with. Special Holiday Ale is a collaboration beer from Stone Brewing Co., Nogne Ø, and Jolly Pumpkin. Each brewery brewed a batch of the beer at their own facility, using the same recipe which included chestnuts, juniper berry, white sage, caraway seed and 25% rye malt. The first to be released was Stone’s in late 2008. I haven’t verified it with Nogne Ø but the general consensus is that they brewed 2 batches, one released around November of 2009 and one released around November 2010. Jolly Pumpkin brewed three batches, one in April 2009 and two in late 2009, all were oak aged and blended together before being bottled in late December 2010. The Stone and Jolly Pumpkin versions were listed as 9% ABV while the Nogne Ø version was listed as 8.5%. I’m not sure what accounts for the discrepency since all were brewed from the same recipe. The Stone and Nogne Ø versions were very similar but I preferred the Nogne Ø beer. At a little over 2 years old the Stone version may have been past it’s prime. It was a bit nutty (the chestnuts?) and much sweeter than the other, the sage seemed to have faded quite a bit but the juniper was still very strong in both the smell and taste. The Nogne Ø version had much more sage in both the smell and the taste, it was much less sweet and seemed to have more balance between the spices and the sweet malt flavors. The Jolly Pumpkin version is the most different, oak aged and soured (with Lactobacillus and Brettanomyces) it was obvious this was the same beer, just with a lot more going on. The smell was very tart and sour like many of Jolly Pumpkin’s other beers. The taste wasn’t nearly as sour as the smell let on. It had a very bitter finish, not from hops but from the other spices used, possibly from the caraway. As far as appearances go, the beer from Jolly Pumpkin was the darkest while Stone’s was the lightest with Nogne Ø’s version in the middle. My favorite of the three was Nogne Ø’s version. I enjoyed the Jolly Pumpkin version quite a bit, but would have preferred it to have been more tart and sour. I remember liking Stone’s version quite a bit when it first came out, and it’s still not a bad beer but it has change considerably. If you’re sitting on any bottles of Stone’s version I would say drink them soon. This post was updated 3/23/11. Thanks to Jeff below in the comments on clarification on a few points I was unsure of originally.